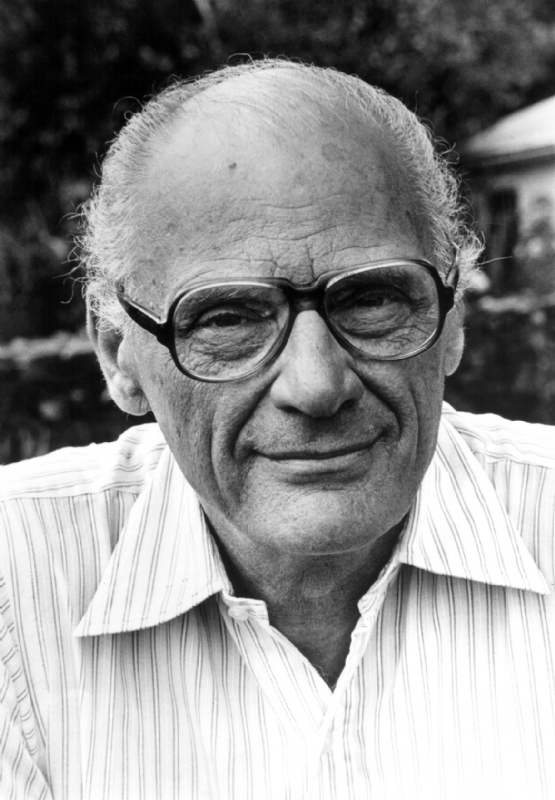 Arthur Miller (born as Arthur Asher Miller in Harlem, New York City, U.S., died in Roxbury, Connecticut, USA) was a famous Playwright from USA, who lived between October 17, 1915 and February 10, 2005. He became 89 years old. Arthur Asher Miller was an American author and playwright. Miller won wide acclaim for plays such as Death of a Salesman and The Crucible, he was also a celebrity through his marriage to Marilyn Monroe in 1956. Arthur Miller was liberal, he was against nuclear weapons and the Vietnam War, and for human rights. Already in the play "melting pot" (The Crucible) compared his persecution of the Communists during the Cold War with the Salem witch trials in 17th century. He is born under the zodiac libra, who is known for Balance, Justice, Truth, Beauty, Perfection. Our collection contains 35 quotes who is written / told by Arthur, under the main topic Life. "Man must shape his tools lest they shape him"
"Let you look sometimes for the goodness in me, and judge me not"
"In the theater, while you recognized that you were looking at a house, it was a house in quotation marks. On screen, the quotation marks tend to be blotted out by the camera"
"If I see an ending, I can work backward"
"If I have any justification for having lived it's simply, I'm nothing but faults, failures and so on, but I have tried to make a good pair of shoes. There's some value in that"
"I'm the end of the line; absurd and appalling as it may seem, serious New York theater has died in my lifetime"
"I think now that the great thing is not so much the formulation of an answer for myself, for the theater, or the play-but rather the most accurate possible statement of the problem"
"I think it's a mistake to ever look for hope outside of one's self"
"I love her too, but our neuroses just don't match"
"I know that my works are a credit to this nation and I dare say they will endure longer than the McCarran Act"
"I have made more friends for American culture than the State Department. Certainly I have made fewer enemies, but that isn't very difficult"
"I cannot sleep for dreaming; I cannot dream but I wake and walk about the house as though I'd find you coming through some door"
"He's not the finest character that ever lived. But he's a human being, and a terrible thing is happening to him. So attention must be paid"
"He wants to live on through something-and in his case, his masterpiece is his son. all of us want that, and it gets more poignant as we get more anonymous in this world"
"Everybody likes a kidder, but nobody lends him money"
"Don't be seduced into thinking that that which does not make a profit is without value"
"Certainly the most diverse, if minor, pastime of literary life is the game of Find the Author"
"Can anyone remember love? It's like trying to summon up the smell of roses in a cellar. You might see a rose, but never the perfume"
"Betrayal is the only truth that sticks"
"All we are is a lot of talking nitrogen"
"A suicide kills two people, Maggie, that's what it's for!" "A playwright lives in an occupied country. And if you can't live that way you don't stay"
"A good newspaper, I suppose, is a nation talking to itself"
"A child's spirit is like a child, you can never catch it by running after it; you must stand still, and, for love, it will soon itself come back"
"Without alienation, there can be no politics"
"The theater is so endlessly fascinating because it's so accidental. It's so much like life"
"You cannot catch a child's spirit by running after it; you must stand still and for love it will soon itself return"
"Well, all the plays that I was trying to write were plays that would grab an audience by the throat and not release them, rather than presenting an emotion which you could observe and walk away from"
"The job is to ask questions-it always was-and to ask them as inexorably as I can. And to face the absence of precise answers with a certain humility"
"The closer a man approaches tragedy the more intense is his concentration of emotion upon the fixed point of his commitment, which is to say the closer he approaches what in life we call fanaticism"
"The apple cannot be stuck back on the Tree of Knowledge; once we begin to see, we are doomed and challenged to seek the strength to see more, not less"
"Never fight fair with a stranger, boy. You'll never get out of the jungle that way"